Spring is in the air which means that lovesick alligators are on the move during mating season. 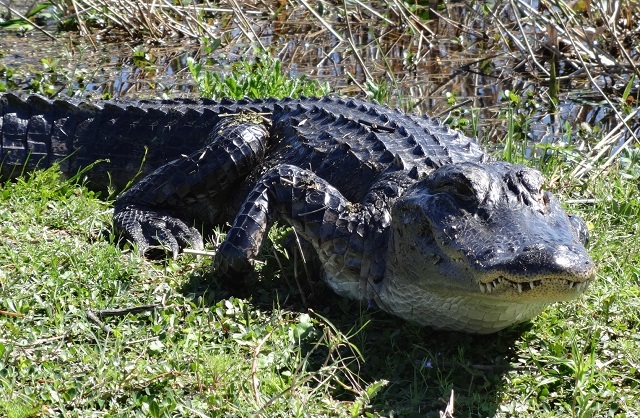 So the State of Florida's Fish and Wildlife Commission (FWC) is providing a few tips on how humans can reduce their accidental encounters with these reptiles which inhabit all 67 Florida counties. Alligators are opportunistic predators with an indiscriminate appetite that includes fish, birds, reptiles, amphibians, mammals, and even fruit. Because of their predatory nature, alligators may target people, pets and livestock as food. Since 1948, Florida has averaged about five unprovoked bites per year. During that period, a little more than 300 unprovoked bites to people have been documented in Florida, with 22 resulting in deaths. In the past 10 years, the Florida Fish and Wildlife Conservation Commission has received an average of nearly 16,000 alligator-related complaints per year. Most of these complaints deal with alligators occurring in places such as backyard ponds, canals, ditches and streams, but other conflicts occur when alligators wander into garages, swimming pools and golf course ponds. 1. Never feed alligators because it is dangerous and illegal. When fed, alligators can overcome their natural wariness and learn to associate people with food. When this happens, some of these alligators have to be removed and killed. 2. Dispose of fish scraps in garbage cans at boat ramps and fish camps. Do not throw them into the water. Although you are not intentionally feeding alligators when you do this, the result can be the same. 3. Seek immediate medical attention if you are bitten by an alligator. Alligator bites can result in serious infections. 4. Observe and photograph alligators only from a distance. 5. Be aware of the possibility of alligators when you are in or near fresh or brackish water. Bites may occur when people do not pay close enough attention to their surroundings when working or recreating near water. 6. Do not swim outside of posted swimming areas or in waters that might be inhabited by large alligators. 7. Alligators are most active between dusk and dawn. So, avoid swimming at night. 8. Dogs and cats are similar in size to the natural prey of alligators. Don’t allow pets to swim, exercise or drink in or near waters that may contain alligators. Keep pets on a leash. 9. Do not swim with your dog. Dogs often attract an alligator’s interest. 10. Leave alligators alone. State law prohibits killing, harassing or possessing alligators. Handling even small alligators can result in injury. People with concerns about an alligator should call the FWC’s toll-free Statewide Nuisance Alligator Program (SNAP) Hotline at 866-FWC-GATOR (392-4286). SNAP uses contracted nuisance alligator trappers throughout the state to remove alligators four-feet in length or greater that are believed to pose a threat to people, pets or property.